Our new hockey footwear collection is more technical and stylish than ever before. Incorporating the latest in materials and 'state of the art' in house design. Our 2017 range offers low profile shoes with excellent mid-foot stability via our anti-roll cage technology. Built for speed and durability. Modified Kookaburra 'cage; technology offering essential mid-foot support. Acclaimed hockey specific outsole to provide superb traction. Latex covered durable upper for added water resistance and durability. Advanced EVA mid sole for superior shock absorption. Stitched toe section for enhanced durability. Padded tongue for improved comfort and fit. 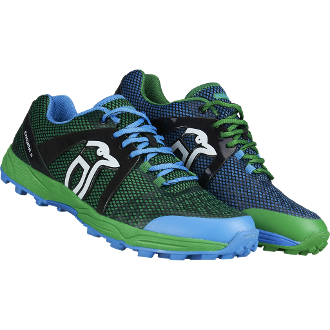 Lightweight shoe with heel and front support to reduce shockwaves.